Friday on the FRINGE: you DON'T want to miss this! That's right - you WILL NOT want to miss: Friday on the Fringe featuring Circus Orange's "TRICYCLE", live, tonight, right here in our very own Center City presented by the The First Niagara Rochester Fringe Festival! If you've been wanting to check out the Fringe the last few years, have heard so many wonderful things about it, but maybe you're overwhelmed with the fact that there are over 380 shows and events and you don't know where to start - Friday on the Fringe is the single most important place you should start to whet your Fringe appetite. The BEST thing about it - it's FREE and it's an evening you won't forget! "If you loved BANDALOOP, wait ‘til you see CIRCUS ORANGE! Part mad science, part street theatre and 100% spectacle, Canada’s CIRCUS ORANGE creates lucid dreams with explosive shows that combine mind-blowing pyrotechnics, special effects and aerial rigging with street theatre, clowning, fire arts, dance and circus. They’ll bring to the Fringe their magnificent production, TRICYCLE, but this is no kiddie bike, folks. 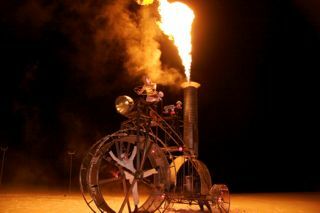 This TRICYCLE is a magnificent, 18-foot machine that makes its nomadic journey right through the crowd, blurring the lines between audience and performer. Improvised, ground-based interactions and stunts take place along the way, with larger production numbers created at key staging areas. Then, try to catch your breath before the TRICYCLE pops a wheelie 60 feet over your head, becoming a human-powered pyro wheel. Oh, and a full-scale fireworks show rages in the background. It’s the most fun Rochester’s ever had on three wheels!"